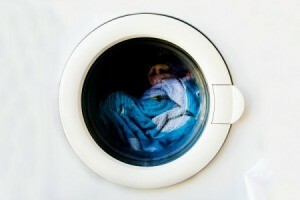 It is frustrating to be left with a wet load of laundry when your washer won't go into the spin cycle. This is a guide about Kenmore washer not spinning. My washer will drain the water out, but most of the time it will not spin. It makes a sound like it's trying too. I can reach inside and rotate the drum counter clock wise until I hear a click and most of the time that fixes it the problem. But I have to do this with almost every load, after the rinse cycle and on the final spin. I just had this same problem with my washer. I did have to call a repairman. He found it was a plastic round "cog" thing that had broken. The part was very cheap but the call and his labor were not. Check your belt. That would be the first step in any appliance that sounds like it is slipping. Been doing this with my Sear's machines - forever! My mom even had those! My Kenmore washer is great, but sometimes the spin cycle doesn't come on. If I hit it on the corner where the lid connects to the washer it always starts it up, but I had someone tell me it was the belt wearing out. I am going to sell it and I want to be able to tell them the truth. I have had this fixed twice, and it is not a belt. I didn't see any belts in the machine at all. I think old gas machines had belts. There is a small part that wears out the transfers energy from the motor to the basket. My repair man fixes this problem in a matter of minutes and small cost, $60 for the service call, I think, and $10 for the part. We run at least a load a day and this happens once every week or two. Pushing the button again is usually rewarded with a brief spin, but it can take a few tries before a normal cycle begins. I read a post here about a similar problem that was cured with a "$10 part" and would like more specific information or other suggestions, please? If the belt is broken, it may be one that can be picked up at your local auto parts shop for about $10. Otherwise, it may be one of the other problems. I have a Kenmore 80 series washer that just recently quit spinning. Well it will only spin if there is nothing in it, but if there's clothing in it all it does is make the noise as if it was spinning. I have checked the switch and that seems fine. Any ideas? I would call a repair person since you probably have a damaged motor coupler. I have always had good luck with contacting Sears Service Center but some of their shops are now closed so that may be making that feature more difficult. Does your machine show an error code? You might try Google Sears Service Center with your zip code to see if they can help you. You may have to call a center that is not in your area. I would start with them first as they know what brand your machine is (Whirlpool, Maytag, etc as Kenmore is just a Sears name) and may be able to help you troubleshoot but if not you can take the next step. Here is a link to a Sears web site that has a lot of information about all of their machine problems. They also have a "chat link" if you need to ask a question but they have lots of DIY videos as well as links for manuals and parts if you need them. Here is a link to a video on YouTube about this or a similar problem but this type of checking/testing will take someone with some knowledge about this type of repair. There are a lot of YouTube videos out there on repairing this machine, which I find concerning, because that means a lot of folks are having this same issue. I don't see any recalls though. Too bad because that is a free fix. Maybe this video can help you if you are handy. Since Sears is in such bad straights and most are closed, perhaps you can ask around and find a reliable general appliance repair person who can look at it if you are not handy. You just missed President's Day sales....which is a good time to buy appliances if you need to get a new one. Perhaps there are some places that held over their sales because that weekend (at least where I am) was a bad weather weekend. My local NEXTDOOR.COM site seems to always have someone selling washers reasonably (you just have to be able to haul it). Post back with an update! My Kenmore series 500, top loading, one year old washer, drains and and the lid locks. But when it goes into spin mode, it immediately stops. Then the spin light starts blinking and continues to do this until being cancelled. My Kenmore washer is locked and it won't spin. What can I do to fix it? I call a repair man. In my town there is a guy who comes on the same day, fixes the machine in 20 minutes, and I am back in business washing clothes after coffee break! Not worth the effort of doing it yourself. My Kenmore washer is making a loud noise on the spin cycle and not spinning. Any suggestions? Do I call repairman or is it junk? Thanks. I've posted this advice before, but not sure where it is archived. If it still doesn't work after levelness is confirmed I'd consider a repairman before trashing it, but I'd ask for and check out the references of any repair person before hiring! I have a Kenmore washing machine that doesn't spin. It washes, drains, and you can hear the spin cycle going, but it will not turn on its own. When it first happened I could manually start the spin by actually turning the barrel and then it would continue on its own, but now it will not turn at all. This happens with both spins on "all" cycles. Is this an easy fix? I don't know the year, as I bought it used, but do know it's not very old. I have a Kenmore washer. The tub does not spin. The clutch is spinning below, but it does not engage the tub. Any answers? Likely this is a small part that attaches to the motor. It is an easy fix, for the repair man. Call one. It took my repair man only about 15 minutes, but he knows what he is doing, knew the part that had to be replaced, had special tools just for this job. I do not think that this would be an easy fix for someone who doesn't know anything about washing machines. You have to take the whole cover off of the machine to get underneath. It looks easy when the repair man does it, but it would be a nightmare for the "home handyman," likely an all day project. I have a 110 series Kenmore washer. It will not spin. It has been suggested to check the pump. How do I get to it? My washing machine does not spin, it is a 15 year old Kenmore. Can I fix it myself? My Kenmore washing machine does not spin. The motor runs, but the basket does not move, it clicks. My Kenmore washer is not spinning. You can hear the motor running, but it won't spin unless I start turning it first. All other cycles work okay. I have a 6 or 7 year old Kenmore washing machine, 110 model. Some times when the spin cycle should start, it doesn't. If I help it, it will start spinning, but only about half speed.